You will be given a Free reference e-book to read which has 317 pages And the test will be based on that e-book. Unified Modeling Language which is abbreviated as UML refers to a general purpose and standardized modeling language which is primarily used in the object-oriented software engineering field. This specific modeling language features a collection of graphical notation techniques that are extremely useful in developing visual models of software-intensive systems that are also known for being object-oriented. One of the most widely recognized versions of UML is UML 2 which is also popular for its 3 major diagram classifications. The first one is the behavior diagram which is capable of depicting a business process or system’s behavioral features. The second one is called the interaction diagram which is known to be a subset of the behavior diagram and works by emphasizing interactions in objects including interaction overview, timing diagrams, sequence and communication. The last diagram classification is called the structure diagram which is capable of depicting the major elements of specifications known for being irrespective of time including composite structure, deployment package diagrams, object, component and class. UML 2 is also composed of features that make it even more functional to users. 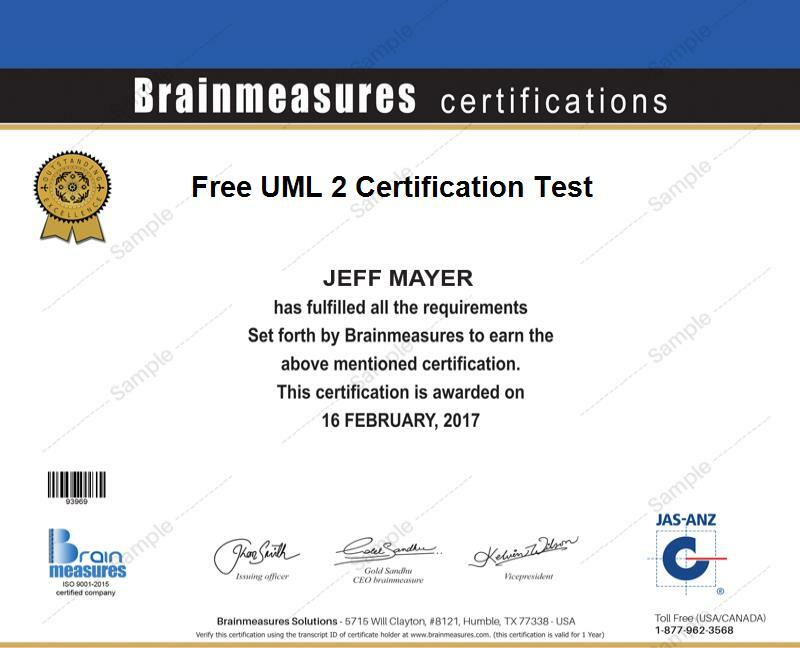 If you plan to become a certified UML 2 expert, then be aware that Brainmeasures, an online certification provider which has gained worldwide recognition for its excellent reputation, now offers a free UML 2 practice course. It also features a free study guide and a well-developed free practice test that are necessary in your attempt to confidently prepare yourself towards taking the certification exam. The free UML 2 certification practice course which is now available at Brainmeasures is your key towards generating a more complete understanding about how the UML 2 version works. This free UML 2 practice course is highly recommended for you because of the extensiveness of its free study guide which covers all the topics and areas related to using and administering this popular version of the Unified Modelling Language. It covers topics such as the scope of the work of UML 2, the most remarkable features installed in it, the benefits that it can offer to users and the different ways and techniques that you can use to get the most favourable benefits out of this modelling language. The free practice test which you can access in this course without paying anything is also a major help when attempting to prepare for the exam and boost your confidence in successfully passing it. The free UML 2 certification practice course is primarily developed to help anyone who wishes to take the actual UML 2 certification exam and obtain a passing rate from this. It works suitably for all aspiring certified UML 2 professionals, administrators, consultants, analysts, programmers, developers, designers and any other professionals who want to start using UML 2 to their most favourable advantage. Earning a UML 2 certification is also extremely useful in acquiring a bigger salary. If you decide to work as a UML systems administrator, then you will be on your way towards generating an average annual salary of $83,000. Working as a UML software engineer is even more financially rewarding since it entitles you to enjoy approximately $82,000 to $131,000 on an annual basis.